The nurse is suctioning a client via an endotracheal tube. During the suctioning procedure, the nurse notes on the monitor that the heart rate is decreasing. Which nursing intervention is appropriate? 2. Notify the health care provider immediately. 3. Stop the procedure and reoxygenate the client. 4. Ensure that the suction is limited to 15 seconds. Answer: Option 3 is correct answer. Rationale: During suctioning, the nurse should monitor the client closely for adverse effects, including hypoxemia, cardiac irregularities such as a decrease in heart rate resulting from vagal stimulation, mucosal trauma, hypotension, and paroxysmal coughing. If adverse effects develop, especially cardiac irregularities, the procedure is stopped and the client is reoxygenated. Test-Taking Strategy: Focus on the subject, a decreased heart rate, and recall that suctioning can cause cardiac irregularities. Also, use of the ABCs—airway–breathing–circulation— should direct you to the correct option. 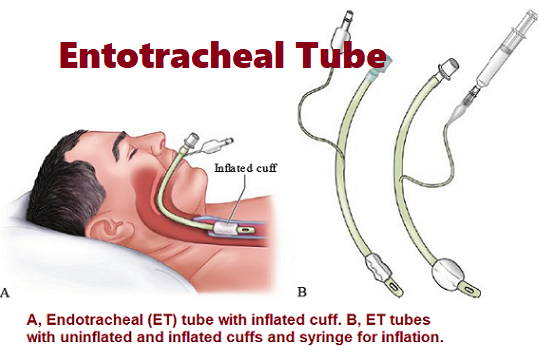 The endotracheal tube is used to maintain a patent airway. Endotracheal tubes are indicated when the client needs mechanical ventilation. If the client requires an artificial airway for longer than 10 to 14 days, a tracheostomy may be created to avoid mucosal and vocal cord damage that can be caused by the endotracheal tube. The cuff (located at the distal end of the tube), when inflated, produces a seal between the trachea and the cuff to prevent aspiration and ensure delivery of a set tidal volume when mechanical ventilation is used; an inflated cuff also prevents air from passing to the vocal cords, nose, or mouth. The pilot balloon permits air to be inserted into the cuff, prevents air from escaping, and is used as a guideline for determining the presence or absence of air in the cuff. The universal adapter enables attachment of the tube to mechanical ventilation tubing or other types of oxygen delivery systems.